ARCHERY - try your hand at the ancient sport of archery and learn the skills and techniques to hit the target every time! FIRELIGHTING & CAMPFIRE COOKING - we'll make bannock bread on sticks, cook dinner in a dutch oven on the fire and enjoy toasted marshmallow and hot chocolate in the evenings. ECO ENERGY WORKSHOPS - discover how we can use natures energy from the sun and wind to help look after our planet. Construct solar jiggling monsters and build mini wind turbines which we'll test to see how much electricity they can make. TECHNICAL TREE CLIMBING - learn a technical tree climbing technique using a rope and harness to safely ascend the big Beech tree ‘David Attenborough style’ and see the woods from a whole new perspective. KAYAKING - learn some paddle strokes before heading out on the river to explore the creeks and see the countryside from a whole new perspective. LEATHERWORK - cut, perforate, hammer and stitch leather into something which will last a lifetime. AERIAL DANCE - get your feet off the ground and take your world to new heights.Combining elements of aerial dance, mindfulness and yoga the workshops are designed to get everyone and anyone into the air. FORGING - work with a local Blacksmith to forge a piece of steel into a toasting fork for marshmallows or make your very own firesteel to use for firelighting. DUSK BAT WALK - a chance to see these nocturnal mammals close up and learn more about them before heading out with the bat detectors to see and hear them feeding along the hedgerows. GREEN WOODWORKING - Transform a piece of wood into a useful object. You will learn how to use ancient wooden machines like the shave horse and traditional hand tools to cut, carve and shape green wood. GROWING AND HARVESTING - tend to the plants in the food garden and polytunnel and harvest fresh ingredients for the kitchen team. 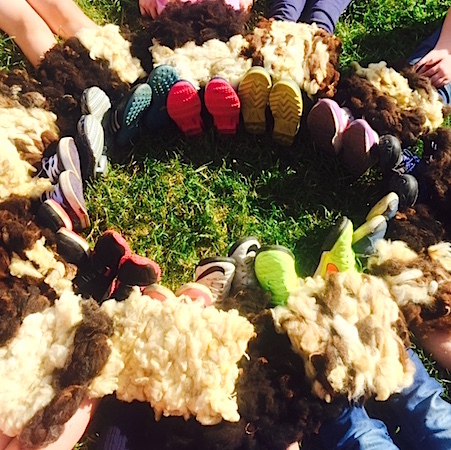 TUFFET WEAVING - use a peg loom to weave sheep's wool into a lightweight woven cushion, perfect for putting on your tree stump round the campfire! COOKING - take a turn as a chef in the field kitchen cooking up something delicious for breakfast, lunch or dinner. NATURAL DYEING - for thousands of years people have been extracting pigment from nature for paint, stains, dyes and ink. You too can learn more about the plants around us and use them to create your own masterpiece. CLIMBING - conquer the climbing wall take in the view from the top of the tower! Challenge yourself with a range of routes to choose from. WILD FOOD FORAGE -discover the edible treasures hidden in the hedgerows with wild food expert Marcus. When we’ve identified and harvested ingredients we’ll cook up a delicious wild food tortilla in the field kitchen. SHELTERBUILDING - we'll design and build shelters using the natural materials of the woodland. We’ll look at different structures, knots, materials and lashing techniques and finally test the structures for waterproofness! MEET THE WOODSMAN - we may be lucky enough to bump into the woodsman. He’s always eager to pass on his knowledge and will share many secrets of the woods, opening our eyes to the plants, insects and animals which thrive here. STONE CARVING - learn new skills from a stonemason which will enable you to carve a hand drawn design into a piece of sandstone using traditional tools. POND DIPPING - discover the weird and wonderful creatures which lurk beneath the depths of the pond. EDIBLE INSECTS - discover how edible insects could contribute to a sustainable food future and have the opportunity to try them for yourselves. COB OVEN PIZZA MAKING - make pizza dough from scratch and harvest fresh ingredients from the food garden (and fridge!) to create a delicious pizza ready to be wood fired in the cob oven. TEAM CHALLENGES - a series of fun challenges requiring a combination of ingenuity, communication, co-ordination and determination! ANIMAL TRACKING - look at the different signs of wildlife and learn simple methods of identification for different species, before following a trail of tracks to determine an animals behaviour and its interaction with the environment. FREE TIME - and a chance to wind down before dinner with a range of games and activities including giant bubble blowing. SILK SCREEN PRINTING - design, draw and cut your stencil, choose your colours and learn how to silk screen print your design onto a t-shirt to take home. FALCONRY - We’re fortunate to have resident buzzards, tawny owls and barn owls who have made their home here. This is an opportunity to learn more about these beautiful birds, hold them and experience them in flight at close quarters. WILD WOOD CAMPOUT - put your new found survival skills into practice with a night in the woods feasting on food cooked over the campfire and sleeping under the stars in your hand-made shelter.